American culture has been fascinated with “doomsday” stories for decades. Science fictions buffs have a variety of end of the world scenarios including nuclear war, giant asteroids, another ice age or alien invasion. New age followers are convinced that we should be paying attention to Nostradamus’s prophecies, which speak frequently about how the world will end. Those prophecies focus on the rise of the three “anti-Christs” who would bring great destruction on the world. Those who believe in Nostradamus think Napoleon Bonaparte was the first anti-Christ and that Adolf Hitler was the second. They are not in agreement who the third anti-Christ will be. Some of the more radical views are that it will be either the Catholic pope or Barack Obama. In recent months a new wave of “end of the world” fever has began to spread as a result of the publishing of a Mayan prophecy that says the current “cycle” of the world will end on December 21, 2012. This cryptic warning has hit the main stream mostly due to the promotion of an upcoming movie that focuses on a fictionalized account of what might happen if that prophecy were actually true. Obviously no one knows if the world will end in our lifetimes. If the world does end, no one knows how or when it would happen. Regardless of our inability to predict the end of the world, thoughts about that subject seem to captivate our collective consciousness. I think one reason such thoughts are so prevalent in modern American culture is because we live in a culture that has gone array. Marriages are falling apart, deficit spending has made the long term economic outlook for our nation shaky, and many of the pillars that have traditionally held our society up seem to be on the verge of teetering. These realities lead people to feel like the whole world is falling apart. Those trends produce emotional anxieties that make doomsday scenarios seem more realistic. For the sake of argument, let’s assume the Mayan prophecy is true and the world as we know it will end on December 21, 2012. What should we be doing to prepare? Should we be building bomb shelters, or stockpiling food, or hoarding gold? If everything is going to fall apart, surely we should be doing something to prepare for such world-wide destruction. Thinking about how we should prepare for the end of the world might actually be helpful. Don’t misunderstand me; I am not a follower of Nostradamus or of the Mayan prophecies. As a Christian I believe that God will bring about the end of the world in His own time and His own way. My faith in the Sovereignty of God in all things gives me great hope and inner peace. Though I do not know what the future holds, I believe that Christ holds the future. This does not mean that I never think about the end of the world, but it does mean that thinking about it does not keep me up at night. My faith helps me sleep well knowing that no matter what happens my eternity is secure in Christ. If the world falls apart, any bomb shelter I could build would not be adequate. I am not rich enough to stockpile enough food or gold to really make a difference if the economy totally collapsed. The reality is there is little I can do of a physical nature to prepare for the end of the world. Therefore I must focus on being prepared spiritually. As I develop my faith in Christ, it gives me an inner peace and strength that prepares me for the end, whenever and whatever it may be. Those who feel a high level of anxiety about the end of the world, or perhaps just the end of their own lives, might do well to develop their own relationship with Christ. Young people especially, who have a whole lifetime yet to live in this very messed up world, would do well to develop their Christian faith. That faith will help them sleep well at night and also help them focus daily on the things they can do to make the world we currently live in a better place. One of the things I love about today's young people is their ability to think and reflect on a deeper level. When I was a young adult, I do not remember having to contemplate as many deep issues in my life as today's young people. It seems that today's young people are surrounded by difficulties and calamities on every hand. Family troubles, financial troubles, political turmoil, climate change, terrorism, and physical and sexual abuse are all issues that today's young adults deal with on a regular basis. Perhaps this explains why so many young adults are filled with despair and confusion. I believe that the despair and confusion that is so prevalent among young adults can only be overcome by the power of Jesus Christ. As His love comes into our lives it cleanses us, restores us, renews us and sets us on a right path. In my ministry to young adults I try to get them to think deeply and to contemplate spiritual issues. It is only through such deep thinking and inward reflection that they will find the spiritual strength needed to survive in such a harsh world. But after many years of working with young adults, I have come to realize that there is a fine line between deep contemplation and just stalling. Some young adults have done enough contemplating to make a decision about spiritual things, but they are unwilling to do so because they realize it will bring significant change into their lives. Even though they know they need that change and that the resulting change will have a positive impact on life, they are still hesitate to follow through on those commitments. At some point their deep contemplation has become a smoke screen for stalling. Perhaps it is a commitment to become a Christian, or to be baptized. Perhaps it is a commitment to break off a relationship that is having a negative influence. Perhaps it is a commitment to give up a bad habit or start a new good habit. Once a person begins to ignore the truth they know deep inside, they begin to suffer inwardly. When a person gets to the point where they know what they should do, but are not willing to do it, they actually begin to move backwards instead of forwards in their journey through life. I am not suggesting that we should stop contemplating deep issues in life and make hasty decisions about things. I am simply saying that once we have thought an issue through and our inner self knows what we should do, then we must take action. We cannot use contemplation as a stalling technique for not doing what we know is right. As we consider what God has been saying to us in our lives lately, what has He clearly made known to us? What has He clearly spoken to us about and revealed His will on? If we are unwilling to do what we know to be true, how can we expect to gain additional insights and understanding about life? We must act on what we already know and then trust God to guide us in the things that we have yet to understand. If it requires great change, so be it. So contemplate deeply, and then take action! Baptism has been a key component of the Christian faith since Jesus Himself walked into the Jordan River to be baptized by John the Baptist. Jesus was baptized to set an example for us and to bring glory to His Father. We know from the Scriptures that God the Father was pleased with Jesus when He was baptized. A major question that I am often asked in my work with young people is “when” a person should be baptized. A growing number of Americans have never been baptized at all. Obviously as those young people discover Christ, we joyfully baptize them. But there is a whole other group of young adults who were baptized as infants or small children into some church that their parents or grandparents were connected to. While this was might have been a very meaningful moment for parents and grandparents, it seldom had much meaning to the person who was baptized as an infant or small child. It was their parent’s choice instead of their choice. It was a ritual instead of religious experience. It happened before they could remember it. It is also quite common for those who were baptized at a very young age to want to participate in a different kind of church when they are older. They often have feelings of great guilt about “changing churches” from the one they were baptized into as an infant. 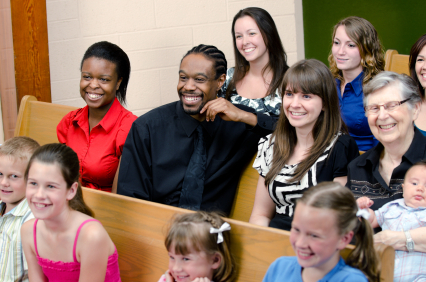 Sometimes parents or grandparents try to discourage a young person from changing churches or being re-baptized into a church that fits their religious views better. How do we respond to young people who express the desire to be re-baptized by their own choosing? When we look into scriptures we do not see a single instance in which infants or small children were baptized at the request of their parents. There is one passage in Scripture where parents brought their children to Jesus to be blessed, and based on that it would be completely acceptable for parents to dedicate their children to God and ask God to bless them. But that is not the same thing as baptism. In every example of Scripture in which baptism is mentioned, baptism was only for those who were old enough to make a conscious decision to repent of their sins and make a commitment to follow Christ. There is no set age in which baptism should happen, but we understand from Scripture that baptism should not happen until the person being baptized is old enough to make this decision for themselves. This is often sometime during the teenage or young adult years, though I have baptized adults as old as 80 years of age. Waiting until a person understands this decision and is ready to make it for themselves is the only biblical time frame for baptism. Many churches have baptism rituals that they have created through their own church traditions. While I respect all churches and do not want to stand in judgment of any of them, the reality is that Scripture is clear on this issue. If church traditions conflict with Scripture, then we really have no choice but to follow the Scripture instead of the church traditions. If you have a teenage or young adult child or grandchild and they express interest in being baptized, please encourage them to follow through on this important spiritual experience. Even if you had them baptized when they were an infant or small child, don’t discourage them from making their own choice to be baptized. This is a very special moment in their lives and they deserve encouragement and support, not discouragement and judgment. Recently I wrote on my blog about how our family tries to use our home as a safe haven for young people to hang out at. I referred to our house as a “happy bubble.” A number of people have enjoyed a good laugh about that particular blog. A number of people have also asked about the cost to us for using our home as a happy bubble. To be honest, there is a cost in time, money and energy. A group of teenage boys can clean out the snack cupboard fast! They seem like human vacuum cleaners when they start eating. But what are a few bags of potato chips compared to a group of young people having a good time in a safe environment? And when the crowd leaves, its takes time to clean up all those empty bags of chips and vacuum the carpet because it’s amazing how many crumbs five bags of chips make! Choosing to use your home as a “happy bubble” will cost you something, but from our perspective the cost is well worth the results. What are the results? Teens stayed off the streets. Teens stayed off drugs. Teens did not make any unexpected babies. Teens did not get into any fights. Teens had a good time. But most importantly, teens know they have a place they can go when they need it. And they know there is someone they can talk to when they need it. That’s the result of the happy bubble. Why not go create a happy bubble in your neighborhood today!